I am Flapper's mummy aka his ghostwriter. 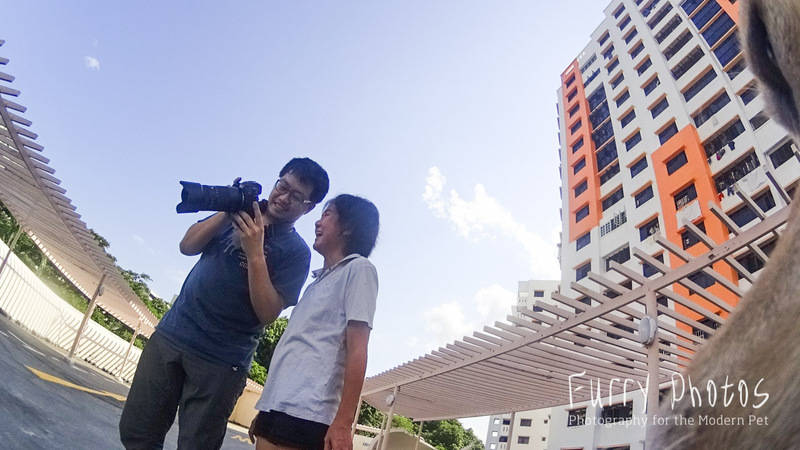 We are now halfway through his wonderful campaign with Sony Action Cam’s 'Prove Yourself: Take your adventures to new heights' campaign, and it is time for some tips and tricks on this awesome 4K Action Cam, the FDR-X1000VR. Before I begin, I would just like to say that I am so grateful and blessed to have been given this opportunity to run this campaign with and for Flapper. I lost count of the years I've yearned for a POV camera to use on Flapper. I have always wanted to pick on his rocket scientist brains to see what he sees and most importantly, to record his moments. And so far, I am absolutely loving the Action Cam, and I am saying that not because they have kindly sponsored Flapper with his own snazzy little camera but I REALLY TRULY LOVE the camera. 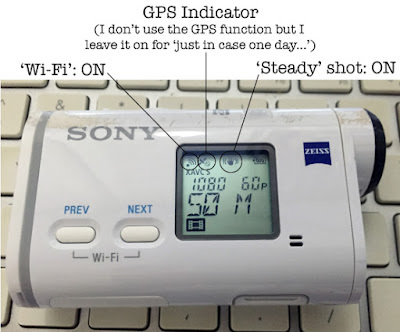 I love that it is user-friendly (easy-to-use). I love that the camera does not disappoint - love the quality and clarity of the videos. I love that it comes with this awesome wrist thing called the Live Remote Viewer. I love that I am FINALLY able to record all our awesome activities and keep it for memory. I love that I am FINALLY able to get a glimpse what Flapper sees. I love that now I am FINALLY able to record some of his old activities that I used to WISH all the time that I could. This is almost the best 9th birthday present Flapper could receive. With all that said, let me commence my top 8 tricks for using the Sony 4K Action Cam and some of its accessories. 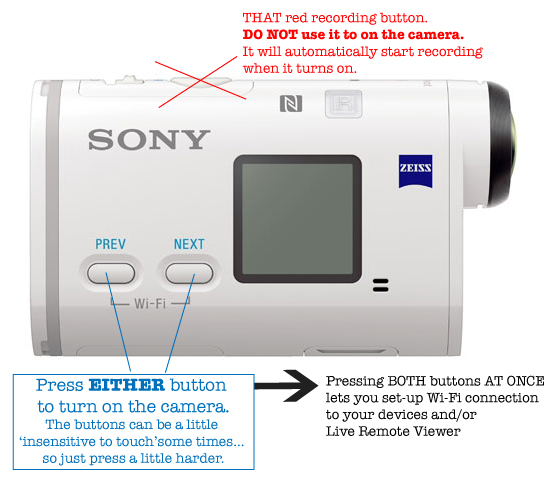 Sony Help Guide - As mentioned before, for a non-professional who has never used a POV camera, this is a simple help guide that will help you through many of your initial "What the hell are these settings? Grrrrr...." moments. Setting up Highlight Movie Maker - the HMM is useful for the following footages: Viewing the footages you have taken (no sound! ); Creating very quick and short videos (just for fun) if you cannot wait to get on your desktop to slllooowwwwlllllyyyy edit the multitude of footages. Creating very quick and short videos (just for fun) if you cannot wait to get on your desktop to slllooowwwwlllllyyyy edit the multitude of footages. However, I seldom use it for Flapper’s POV videos as the footages can be too shaky for HMM to pick up. I love the Sony Help Guide. The webpage is easy to navigate, clean and simple. After the initial 'eh... what are these settings?" moments, the camera is actually really easy to use and foolproof. I had many "What the *beep*! Why is it recording on its own?" moments. 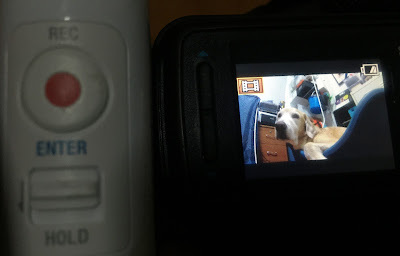 THAT red button can be very useful if you want to do immediate "I need to capture that moment NOW" recording... especially those little moments with the pets. Okay okay... if you haven't read my ghostwriting raves about the Live View Remote, I will say it again. It is actually very easy to use. It is waterproof and hardy. The battery life is amazing! To date (just over two months), I have probably charged the LVR.... twice or thrice maybe. It controls up to 5 cameras simultaneously. The view-switch between cameras is fast. The record button on the LVR allows the user to run the recording of different cameras at the same time (very useful for different POVS so each file recording on each camera syncs together). 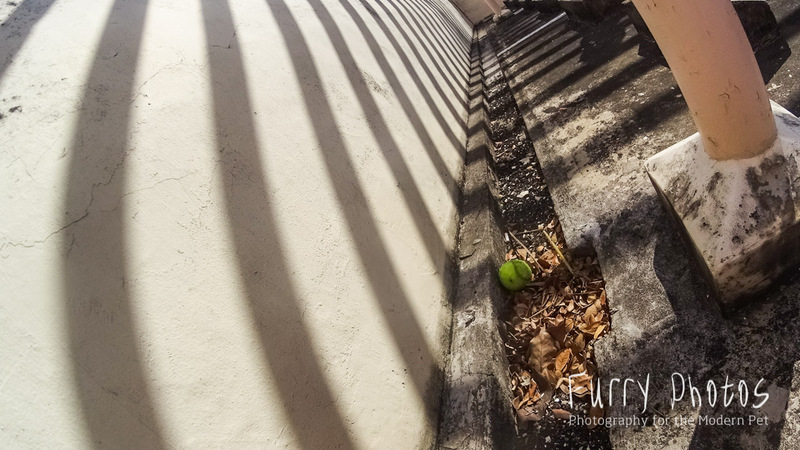 It is the perfect POV camera companion for a control freak - you can actually frame and see what you are recording. The LVR is really easy to use but for a camera-dinosaur, I did have my 'duh' moments trying to figure out what each image on the screen represented. So do spend a bit of time playing around with the LVR to figure out what each picture means. The LRV allows live view of the image you are recording. Here is Flapper lazing in his favourite tiny bed whilst keeping me company. Set-up your LVR before your first activity especially if you are using more than one camera. For first time users, it may take a few tries. Make sure you have your Wi-Fi password with you. To do quick views/playback (no sound), connect to your mobile device(s). After connecting the cameras to the LVR, you are still able to connect and use the cameras individually at any point of time without changing the Wi-Fi setting on the camera and LRV. 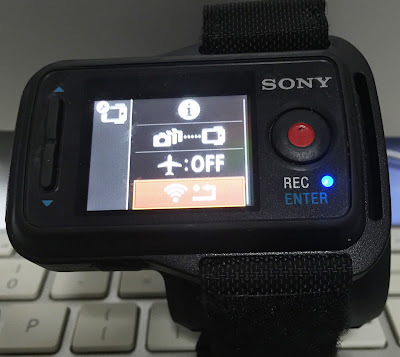 To record different POV at the same time (with more than one camera), press the record button on the LVR and it will activate recording on ALL cameras at the same time. To record just using a single camera, press the record button on that particular camera. The camera, as much as it looks 'plastic-ky' and somewhat like a kid's toy, it is actually quite hardy. Unless you have tech-death-finger(s), the camera won't crash on you. Just play around with the left, right button to explore the functions and settings (record button to select). Then play around recording silly things to see where each function can take you. Refer to the Sony Help Guide when you have no clue or forgot what those functions actually mean. 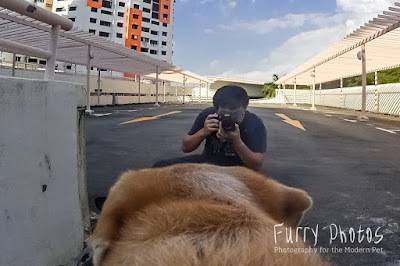 Unlike DSLRs, there isn't that 'automatic' setting that you can just half-click brainlessly for the camera to auto-focus so that the images turn out looking decent. 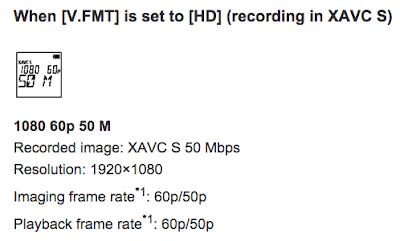 So, if you are a lazy user like me, it really helps to find sweet spot default setting that works for you = almost chop-guarantee the end video footages will not fail you regardless whether you are taking fast or slow moving videos, indoors or outdoors etc. etc. This also means you just turn on the camera and press record. Not all settings are compatible with HMM. Video file sizes are relatively manageable for the desktop/laptop/computer. It is approximate... 1 minute = 1 GB. "Only". Ha! Hint: External hard disk drive is very very important. Hint: Keep each recording to around 4 minutes for easy transfer to the external hard disk drive. 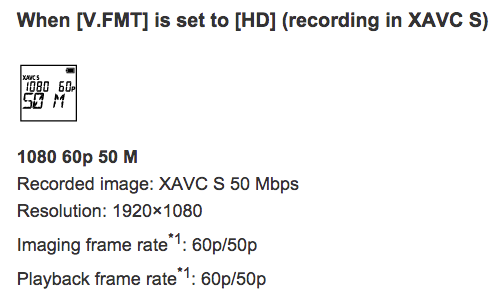 Video file sizes will allow MORE recording time on the camera (the higher the settings, the bigger the files). If 'mount' mode is not set, you cannot use that Highlight Movie Maker. I stick to default 'Body' mount and never bothered to use 'Others'. 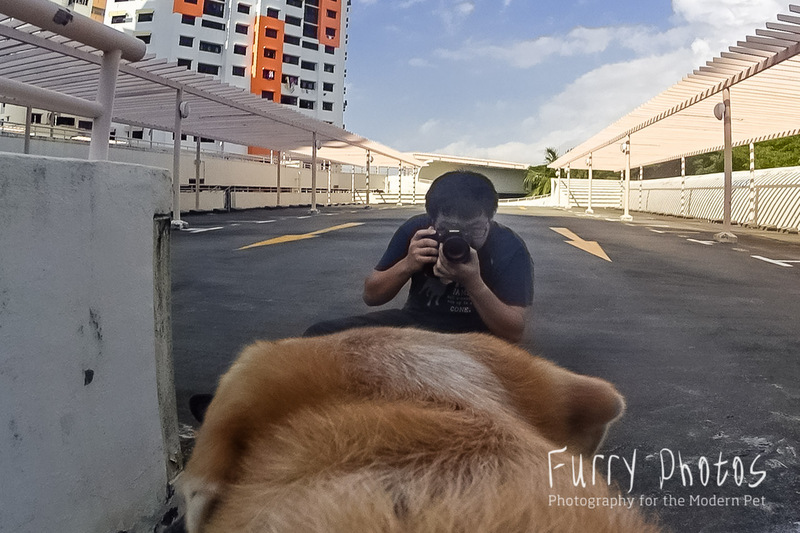 For non-professional camera users like myself, AUTO is a good mode to be on. I use it for underwater too even though there is 'water' scene-mode. Rather damage the waterproof case than the Action Cam 4K. The gorgeous artwork done by a Mr Flapper, missing the lens by 1 mm. It was once upon a time a clear casing. It is now somewhat... matted (scratched). Flapper is really rough and brutal with the camera when he gloriously RUBS himself on any surface including concrete ground. I have to give a big thumbs-up that the casing and camera have not died on me or gone into pieces. 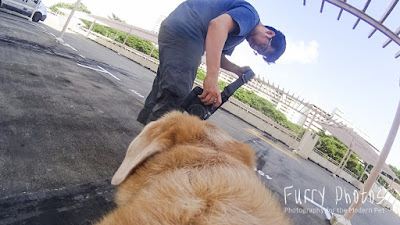 This is one topic I am going to spend quite a bit of time on just because it is really different working with dogs. 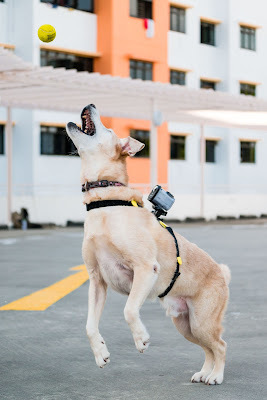 It is really NOT easy capturing a dog's POV due to their movements and the accessories available to capture a dog's POV. BY THEORY, I would daringly say that the design team did put some careful thought process has been given to this harness design - trying to make it multi-functional at an affordable price for consumers - thus all that velcro. 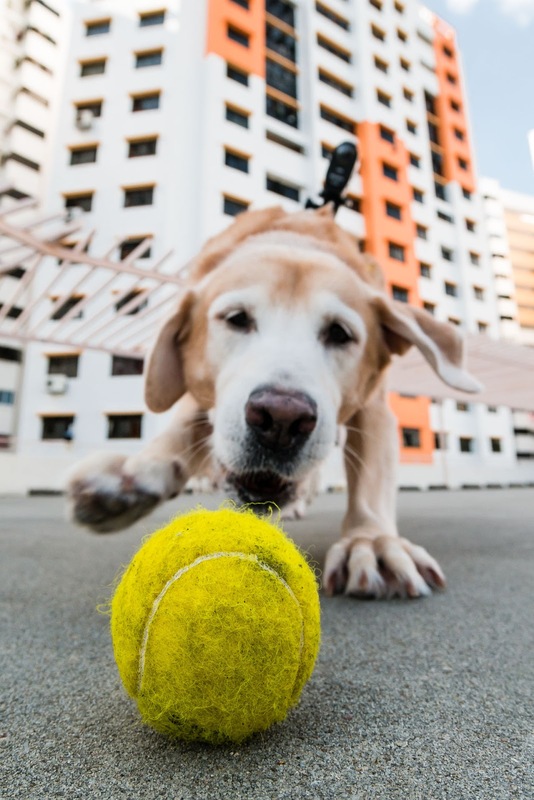 That rubber 'saddle' to make the harness lightweight and easily conforms to the dog's body. While the velcro is useful, it is not ideal. 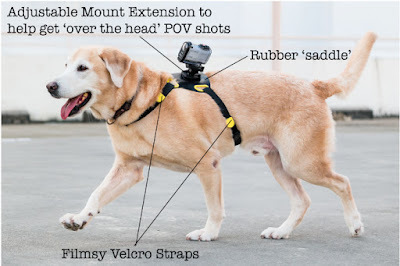 The straps are too thin, and if one has a dog like 'back-rub' Flapper.... the lifespan of the velcro will be short-lived. You may also end up having to do treasure hunt for the Action Cam amongst bushes. Ha! It lacks a centre anchor point. 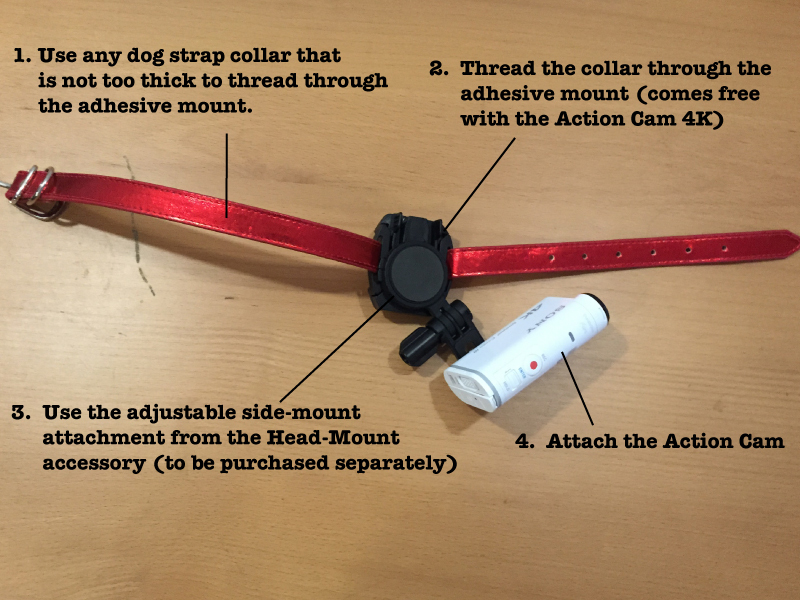 With only 2 thin straps in place, the harness will swing from side to side especially with the bigger dogs. As you can see from the image above, the camera was tilting to the left side. That rubber 'saddle' - It's actually quite a cool idea because it is light weight (comfortable for the dog) and it does conform to the dog's body shape. However, once the extension mount and the camera with the underwater case goes on, it does not hold the weight well. The mount extension: Be mindful that it does not perfectly hold the camera in place as the camera will tilt upwards as the dog runs. You can see in this image that the camera has gone "Hello Sky!" by the time Flapper came back with the ball. For high-speed running shots, ditch the extension mount. 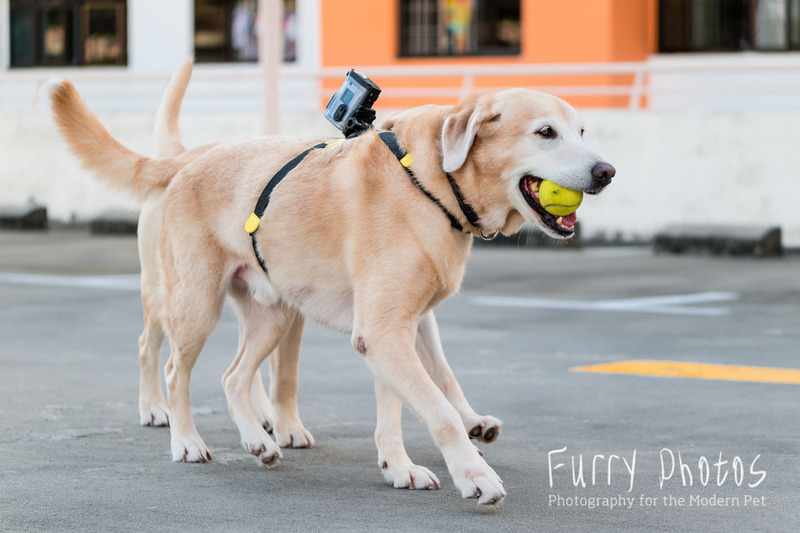 Just attach the camera directly to the harness (more stability instead of the mount swinging from side to side). Harness positioning is crucial too. The harness at this position is NOT ideal when the dog runs at high-speed. 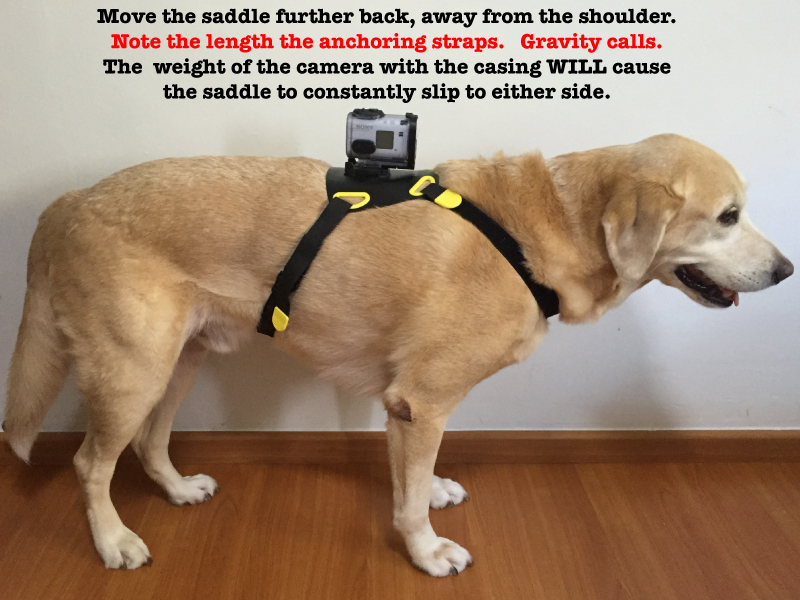 Ditch the mount extension and move the harness further back. Will be great if there was that crucial third strap anchor in the middle. My favourite video thus far of Flapper in action and his POV as he went on this bush-dive-hunt. Flapper's POV videos, this is my favourite action video to date! 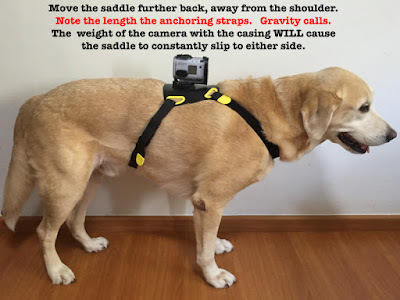 For 'still'/minimum movement POVs (the dog is just standing or lying - NO sitting) - the extension mount is very useful to get over-the-head shots. The back-mount will only capture sky shots when the dog is sitting or jumping and ground shots when the dog is facing downwards. POV as he aimed and jumped to catch the ball. I got a whole lot of blurred movements and floor. the dog is sitting down. 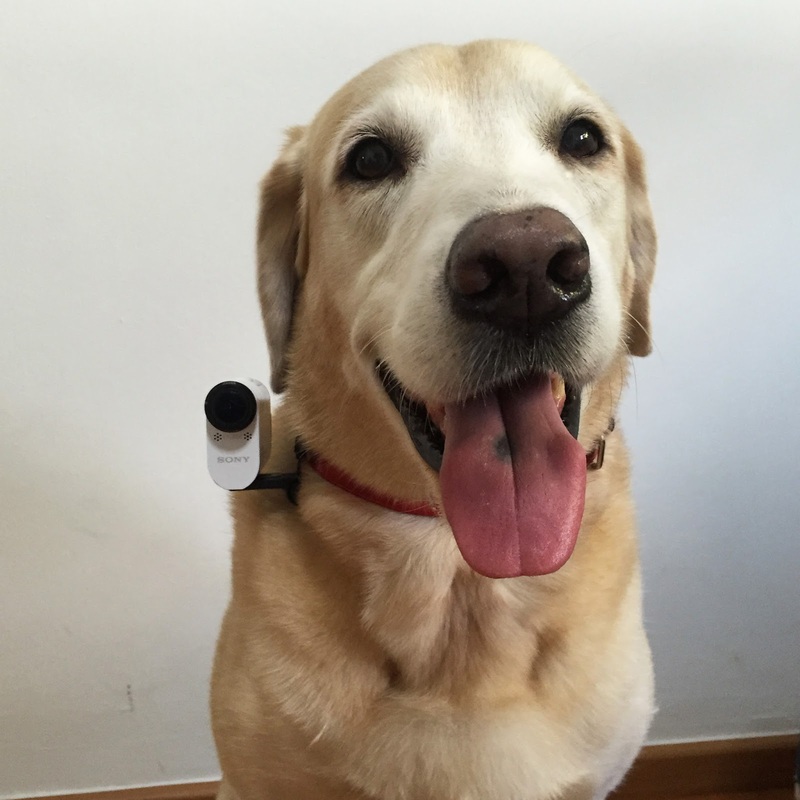 And since Sony has not created a head/collar/front mount accessory for the pets.... here's a little idea on how you can create one. the camera but the greater the distance, the less stable the camera. either but good enough for 'still' POVs i.e. our video of Frodo's car ride. And when you finally managed to capture some good dog POVS, sit back and have a good laugh... at Frodo. Perfect shot of the ball flying right pass Frodo. The cruel humans having a good laugh over Frodo's inability to catch the ball. When the photographer gets caught on camera. 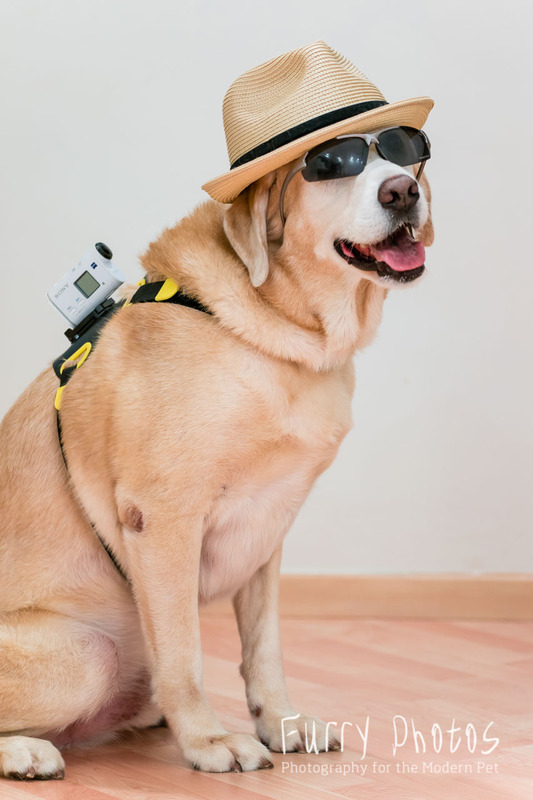 Have an idea of what you are doing with the dog/pet before strapping the cameras on. This will help you determine what works best and how. 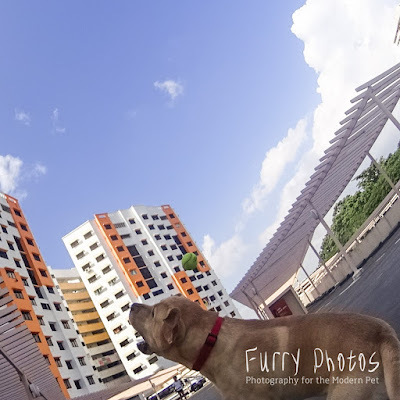 Stay tuned to watch our upcoming new videos of our adventures which will feature more of Flapper's POV! This was... one of the biggest excitement for owning a Sony Action Cam - to take it underwater with the boys! The Action Cam (comes with underwater casing) motivated me to teach Flapper how to go underwater... just for the fun of it. The camera did not disappoint. We had oodles of fun attempting underwater shots and Flapper had oodles of fun trying to get the toy. P.S. The 'edited-out' videos gave me a very good insight to how Flapper thinks. 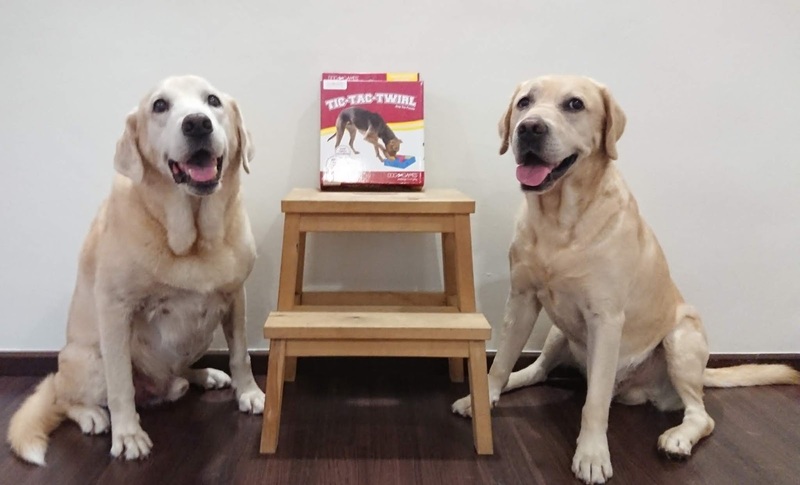 He would look at the toy above water to determine the position, then plunge his head in while using his paw to feel for the object position. Okay Flapper. Mummy get it. You're quite a genius. GET THE FLAT DIVE DOOR LENS. 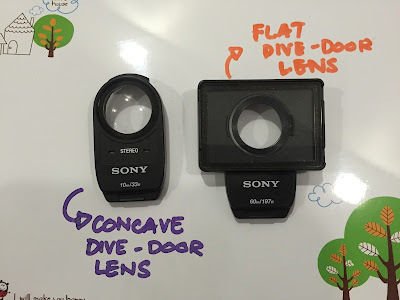 The concave lens comes default with the waterproof. Flat Dive Door Lens needs to be purchased separately. Flapper underwater image using the Concave Lens. Image is blur and colour somewhat muted. This image was taken using the Flat Lens. My favourite UNDERWATER video using the Flat Lens! A particular Mr Choo of the family is a Koi enthusiast. I could not resist testing the Action Cam in his four feet deep fish pond to see his giant koi and the chubby goldfish. Live View Remote loses connection once the camera goes underwater. Just note that the flat-lens does not fog up in a glamorous way. So when that happens, don't panic. It will de-fog eventually. I confess. I panicked. The original waterproof case only goes up to 10 metres/33 feet. With the Flat Dive Door lens, it can apparently increase the depth to 60 metres/197 feet. I have not taken it to such depth so I cannot verify this. 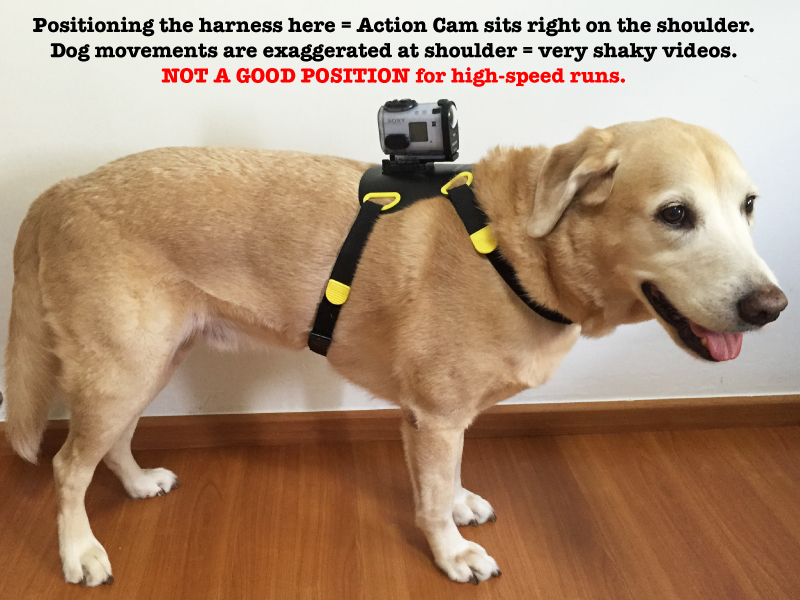 And that's my top 8 tips and tricks for the Action Cam 4K. I will just end off by saying again that the Action Cam is a fabulous POV camera to own. It has been fabulous and frustrating at the same time pushing myself to the limits trying to create different adventures/activities with Flapper. The videos may not show the many setbacks we've had just trying to get one adventure into our books but it is nevertheless a blessing to be able to create what we had, have and will be doing and most importantly, to be able to capture every little moment with the Action Cam. And life moments captured on a POV camera is more powerful than Flapper running through an agility course. 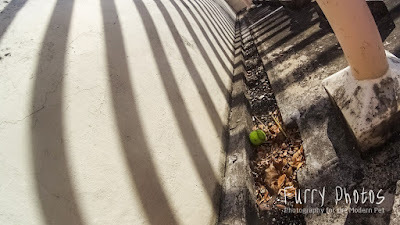 So what's my biggest tip of all for the Sony Action Cam? It captures irreplaceable life moments beautifully. Flapper's visit to My First Skool. Moments like this.... I give thanks for owning the Sony Action Cam.